Bobby Dollar (Doloriel to the heavenly host) is an earthbound angel, an advocate fighting to keep souls out of hell. After so many years living on Earth, he’s grown bitter, disillusioned, going through the motions in the never ending contest between Heaven and Hell. When a soul comes up missing on his watch, everything changes. Never has a soul been lost, and Bobby Dollar has to figure out what’s going on before he takes the fall. Has Hell stolen the soul out from under heaven’s nose or is something even worse going on? And worse off, the new guy is asking questions. With the help of Sam, Bobby’s best friend and fellow angel, and a cast of colorful characters, Bobby will have to ask the right questions to figure out what is going on. Bobby Dollar will have to dodge ancient demons, sultry femme fatales, and angry Lords of Hell to uncover the secret that may shake the foundation of Heaven and Hell. The Dirty Streets of Heaven is a classic Noir detective story. You have our bitter, borderline alcoholic protagonist in Bobby, people who should be on his side but he can’t quite trust, bad buys who may or may not be out to kill him, women who can’t be trusted, a macguffin to recover, and a conspiracy to unravel. And all set in the sunny streets of San Jude in the bay area. A modern take on the noir story complete with a fantasy patina. 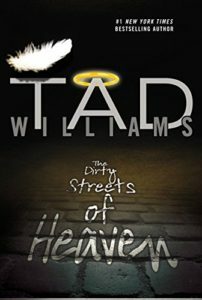 Williams has created a rich mythology for his war between Heaven and Hell. It is clearly thought out with plenty of new revelations to come on how it all works and the secret war being waged beneath the noses of regular mortals. The same care he puts into his other works is on display here. Form the noir to the urban fantasy elements, Williams balance them all perfectly to make an exciting tale keeping the pages turning and you wanting to find out what’s next. If you’re a fan of Urban Fantasy, Noir, and good writing, then you need to check out this series! You can buy The Dirty Streets of Heaven from Amazon.